There’s no charge for this event, and we’ll lend you the music you need for the evening. You’re welcome just to come and listen if you don’t want to sing. Refreshments are served during the half-time break. GETTING THERE: From the A12, the school entrance is half way down Ley Street on the left: just drive in and you will find plenty of parking at the back of the school. 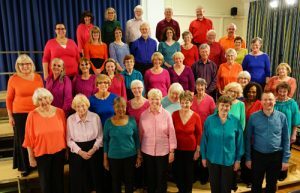 It would be helpful to let us know you are coming: phone 01708 751097 or email info@valentinesingers.org but don’t worry if you can’t – just turn up !